Semi mount rings give couples many choices. Semi mount diamond engagement rings allow many couples to create exquisite settings without the work of designing them from scratch. Before choosing a semi mount, however, it is important to understand how to select the best design and what other limitations may be. What is a Semi Mount? 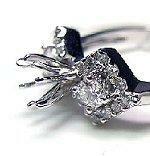 The "mounting" of an engagement ring is the process of setting the focal diamond into the ring. The prefix "semi" means partial or half. A semi-mount engagement ring, then, is one that is only halfway complete: it lacks the center stone, though the accents and other setting details are finished. Semi mounts give couples far greater flexibility than full engagement rings. They can choose the best carat size, diamond shape, and quality stone for their preference and budget without sacrificing the beauty and detail of the setting because of a jeweler's arbitrary decisions. 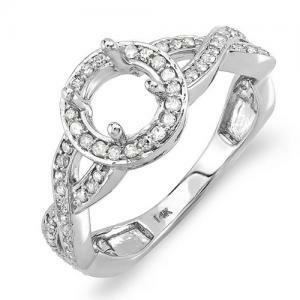 Semi mount accented with round diamonds. Solitaires: It may seem contradictory to sell a semi mount ring when there is only one gemstone to focus on in the first place, but an elaborate band with engraving, detailed filigrees, or a figural design is a popular type of semi mount. Bridal Sets: With a detailed setting and coordinating wedding band, the only detail left to make these semi mounts into exquisite pieces of jewelry is the center stone. Accented Rings: This is the most common type of semi mount: a ring with stylish accents that can be paired with the couple's choice of center stone. 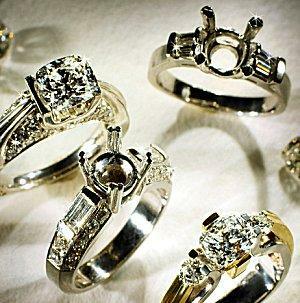 Different accent stone shapes, including baguettes, round gems, princess cuts, or emerald cuts, are frequently available. In addition to different overall styles, semi mounts are available in different precious metals, including white gold, yellow gold, and platinum, giving the couple even more options for creating their perfect ring. Purchasing a loose diamond that suits their budget and style. This is a popular choice with shapes such as cushion cuts, Asscher cuts, or heart shapes that are hard to find in traditional engagement ring styles. Resetting the diamond from an heirloom engagement ring, especially if the original ring's style, size, or condition is inappropriate. Upgrading from a simple engagement ring to a more elaborate style, perhaps because the original ring did not suit the bride-to-be's tastes or the couple could not afford the ring they initially desired. Resetting the center stone into a semi mount keeps the connection to the original ring and preserves its symbolism. Choosing a semi-precious gemstone instead of a diamond. While many jewelers offer a range of gemstone rings, they are not usually as detailed or elaborate as engagement rings, and couples that want a colored stone in an elaborate setting have many more options when considering semi mounts. Once the couple has decided on their central gemstone, the next challenge is to find the semi mount to accompany it. Semi mount costs do not include the center stone. Semi mounts can be difficult to find; naturally, jewelers would prefer to sell complete rings instead of partial designs. During restyling events, however, most jewelers carry a wide range of semi mounts to choose from. Other options include browsing online jewelry stores specializing in semi mounts. Some designers even offer semi mounts, giving couples the chance to own a designer piece without the expense of an entire designer ring. This does not mean that semi mount diamond engagement rings are inexpensive, however. Like any jewelry, the total engagement ring cost depends on the diamond quality of the stones as well as the type of metal and detail of the ring. The total carat weight of the accent stones is also a factor, and couples should be aware that these costs do not include the center stone. The price for just a semi mount may range from less than $200 for a simple design to more than $5000 for a designer piece with multiple accents. When choosing a semi mount diamond engagement ring, couples need to be aware that this type of customization does not guarantee the perfect ring. Because the stones are already set in the band, semi mounts may be difficult to resize, and even the center setting may not be appropriate for every stone size or shape. Some jewelers design semi mounts with "peg head" settings that allow different shapes to be substituted, but a poor shape choice can create a disproportioned ring. Similarly, an elaborate semi mount may overshadow a small center gemstone. For a couple that wants a unique, personalized ring with coordinated, designer qualities, semi mount diamond engagement rings are a great option. Choosing the best design and coordinating carefully with the center stone ensures a flawless, gorgeous ring sure to bring the two halves of the relationship together as a unified whole.